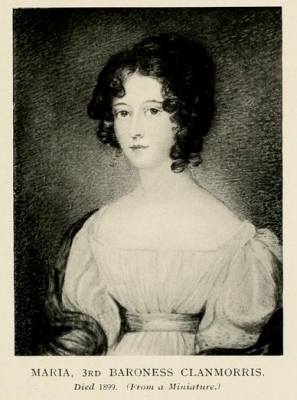 From 1 May 1825, her married name became Bingham.1 After her marriage, Maria Helena Persse was styled as Baroness Clanmorris of Newbrook on 3 June 1829. [S163] Ashworth P. Burke, editor, Burke's Genealogical and Heraldic History of the Peerage, Baronetage and Knightage, 75th edition (London, U.K.: Harrison and Sons Ltd, 1913), page 437. Hereinafter cited as Burkes Peerage and Baronetage, 75th ed. [S163] Ashworth P. Burke, Burkes Peerage and Baronetage, 75th ed., page 436. From 5 June 1907, her married name became Bingham.1 After her marriage, Mowbray Leila Cloete was styled as Baroness Clanmorris of Newbrook on 4 November 1916. [S2] Peter W. Hammond, editor, The Complete Peerage or a History of the House of Lords and All its Members From the Earliest Times, Volume XIV: Addenda & Corrigenda (Stroud, Gloucestershire, U.K.: Sutton Publishing, 1998), page 180. Hereinafter cited as The Complete Peerage, Volume XIV. Children of Nelita Manfield Pringle and Sir Joseph Lister Cheyne of Leagarth, 2nd Bt. [S4685] Isabel Hutchison, "re: Hutchison Family," e-mail message to Darryl Roger LUNDY (101053), 21 June 2010. Hereinafter cited as "re: Hutchison Family."